If your anything like any of us, you haven't even started your Holiday shopping! November 1st to December 31st Americans are expected to spend $923 BILLION on Holiday shopping! Holy Cow! With the internet being so readily available for our shopping needs, lets touch base on some internet shopping tips. Because let's face it, shopping in a store can be so stressful and hard to control our shopping habits! And who can forget, eeeek, Target! And any retailer with a security promise on their site. Also, we LOVE Paypal because they protect your identity through the check-out process for you! If the sales look too good to be true, they may be a scam. Lot's of oversea scammers hit us for Holiday sales and exploit our inner frugal ways. Always verify with BBB or ratings before making such a great purchase! If your doing your shopping at a local Starbucks, remember that their wi-fi may not be protected. So consider downloading and using a VPN - or a "virtual private network" if you plan on using your credit cards for online shopping! Look for a little "lock" symbol to the left of the URL to see if the website is secure. Another way of doing this is to check for the "S" in the HTTPS part of the URL or link. - Use a mixture of uppercase, lowercase, numbers and symbols. - Never use the same password OVER and OVER. A data breech at one company can give hackers your info for other sites. No online shopping website will EVER need your social security number, children's names (unless your customizing something) or other information that your bank wouldn't even ask. If you find a online retailer asking these questions upon checkout, consider looking them up on BBB or calling their customer service and asking WHY! Most websites are now linked to Paypal, which we love. It makes online shopping much more easier to sign into your PP account and finish the steps that way. But if you find a website asking for a credit card, consider purchasing a prepaid credit card prior to online shopping JUST IN CASE you come across a spam website. This will protect you and your bank from getting hacked. Also, don't forget to check your bank statements to make sure the right amount was withdrawn. If you see an issue, do not wait to dispute it, dispute it right away! When making online purchases, either print out your confirmation email or keep track of where you bought what in a notebook. If you don't get your goods within the promised time or a reasonable time, report it right away! We love Amazon Prime for this reason, they have an amazing customer service and with the hundreds of packages we have had delivered, only a few, small issues arose and were taken care of very promptly! We will be waiting for our gifts! 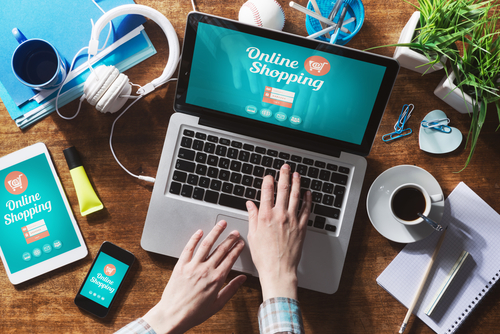 What other online shopping tips, tricks and tools can you share with other readers? Tell us below!